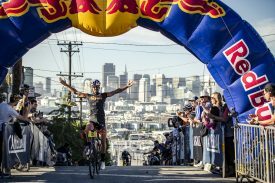 San Francisco, CA (September 9, 2018) – The second annual Red Bull Bay Climb took over iconic Potrero Hill in San Francisco yesterday, September 8th. Cyclists participated in fixed and open gear races, and the “run-what-ya-brung” spirit of the event allowed folks to grind out the intense course on whatever human powered, two wheel bike they brought. Thousands of excited spectators lined the steep city blocks that surround the course, and provided much needed encouragement and support to the determined riders. Like San Francisco, Red Bull Bay Climb brings together a diverse range of people, united by their passion and gumption. The race offers a unique chance for cyclists ranging from amateur to professional to test their endurance and determination over the three-block course. The course features a fun combination of steep inclines averaging 15% and topping out at 21%, and limited distance. Because the course is just 0.32 miles long, a wide range of riders show up to compete with an at-capacity field of 256. The heats in each category; Women’s Open, Men’s Open, Women’s Fixed, and Men’s Fixed, featured a maximum of 10 riders, a percentage of whom progressed through semi-finals. Competitors were whittled down to the top 3 athletes in each class, meaning that the final race in each grouping showcased the three podium placers, in a heart pounding sprint for the finish line. The winners in each category were: Women’s Open – Defending Champion Hanna Muegge, Monterey, CA; Men’s Open – Payson McElveen, Durango, CA; Women’s Fixed – Evelyn Hound, Rancho Cucamonga, CA; and Men’s Fixed – Enrique Martinez, Los Angeles, CA. “This event was such a cool concept because at the root of cycling, regardless of what discipline, the hill is such a classic challenge. Anyone from any cycling background can come here and test themselves and have a great time,” said Payson McElveen, Red Bull mountain biking athlete and Red Bull Bay Climb Men’s Open Winner from Durango, CO.
Red Bull Bay Climb is proud to partner with a number of local and regional bike partners, including competition partner Mission Crit, a fixed-gear bicycle race in San Francisco, Specialized and Machines for Freedom, Rapha, Chrome Industries, CamelBak, Anchor Brewing, Cognition Cyclery, Red Kite Racing, Rock Tape, Goal Zero, Maven Car Sharing. Specialized and Machines for Freedom covered the entry fees for all female participants, encouraging more women athletes to take on the challenge in cycling competition. Other notable partners and supporters of Red Bull Bay Climb that provided prizes for winners included Chrome Industries, Rapha Cycling, and Specialized, and Anchor Brewing supported the official after party. LOOKING FOR RED BULL VIDEO AND PHOTO IMAGES?